This is a quick snapshot of a traditional house and its site plan currently in progress. I'm posting this to illustrate the larger view of architectural design. It's common to understand traditional residential design as the simple front elevation shown in the black and white image. These are easy to create as a mirage to fool the eye without really understanding the relationship of all the materials and forms. About 99.9% of "blueprint" plan websites do this. But the designs are not grounded in reality. Neither are they grounded on the ground. That's the point here, the house design and the site need to be connected for a cohesive approach. This site plan shows the front drive circle aligning with the entry gable of the house. Existing topographic lines (light grey) and proposed (bright green) plan how the ground is re-graded. Each line represents one foot. Compare how the topopgraphy drops off around the house to the right in both site plan and elevation. See how they match? The grade makes a huge difference to each side of the building. But this isn't something that a simple house plan coordinates. It takes working back and forth between the two to refine the design. This is called site-specific design. This entry was posted in 4D»2B, Site Planning and tagged house, residential, site planning on 2017-09-08 by Steve Hall. You'll notice the markings in my yard include two orange lines, one for telephone and the other for cable television. It's not uncommon for multiple services to be present that are owned or managed by different companies. In the Triangle exist many other common services: fiber optic data, liquid petroleum, natural gas distribution, security, satellite downlinks, irrigation, and re-claimed water. These conventions came about because buried services are a huge hazard and having conventions to locate and key them are critical to the nation's infrastructure. A 1999 US Department of Transportation study was the impetus for tying local, regional, and national governments and utility companies to a clearinghouse of locating services available to the public for free. This is done through the auspices of the Common Ground Alliance. If you're planning any kind of construction, repair, or installation within the ground, get all the utilities located for free through the website or three-digit telephone number: 811. SteveHallArchitecture uses these same colors in our electronic drawings for consistency with the AWPA standards and continuity with what we see in the field. 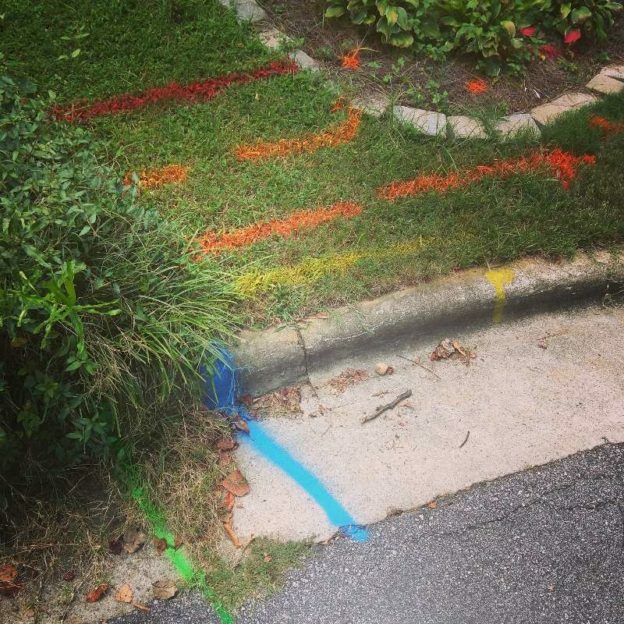 In a fast growing area like the Triangle, you'll see these markings everywhere. Next time you take a walk, test yourself on the standard! This entry was posted in 4D»2B, Code, Site Planning and tagged APWA, code, color code, site, site planning, utilities on 2017-09-08 by Steve Hall. Staking day on site, laying out and adjusting 22 corners of a 5,100 SF footprint to see how the placement feels... with just a string and a 300' tape. 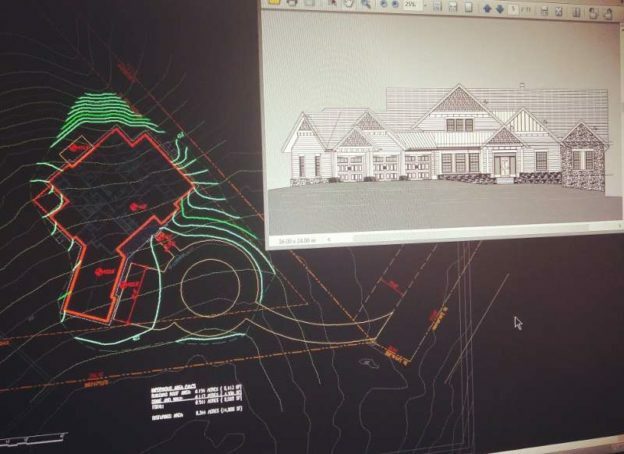 This entry was posted in 4D»2B, Site Planning and tagged design, residential, site planning, staking, survey on 2017-09-08 by Steve Hall. Connections are the biggest challenge of material design. 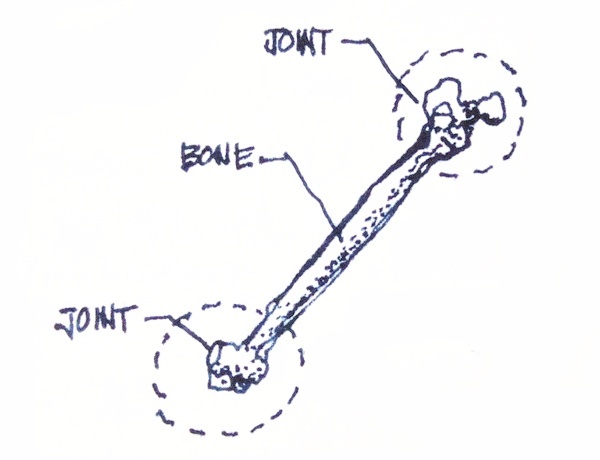 I like to use a femur to illustrate this concept. Do you see the straight shaft of the bone? Relative to the rest, it is quite simple. Although you wouldn't want it to happen, a femur broken in the middle can heal, maybe with assistance of pins and plates, back to 100% mobility. Broken joints, on the other hand, are rarely fully restored. Hip replacements can be pretty successful. But the complexity of interfaces between bone, cartilage, ligaments, tendons, bursa sacs and muscles at the other end make full recovery unlikely. Architectural materials are no different. A femur is much like a column. Designing a column size is relatively simple work. There are common tables to set the basic sectional dimensions capable of managing a given vertical load. The real work in structural design is determining how the column's base and capital are connections at its base and the beams it supports. Are they welded or bolted? Are there lateral forces being managed by those connections? How do we manage cracking and settling at the footing? Are the beams resting on top of the column or are they bolted on to its side? Are vertical columns continuing above? Countless more decisions are resolved. Just like in animal structures, failures in building structures are most likely at the connections, too. So designers spend most of their time working out connection details. The same principle can be seen in materials. Take for example, wood. It is beautiful, but challenging to work because it is unstable. Wood warps and moves even with minor temperature or humidity changes. Much of wood design and craftsmanship involves designing around this temperamental nature. The slab in the sketch below is a piece of wood that will move a great deal in the vertical direction. Wood is more stable along its length, but perpendicular to the grain movement can be up to a half a percent. You won't notice this... until it cracks. 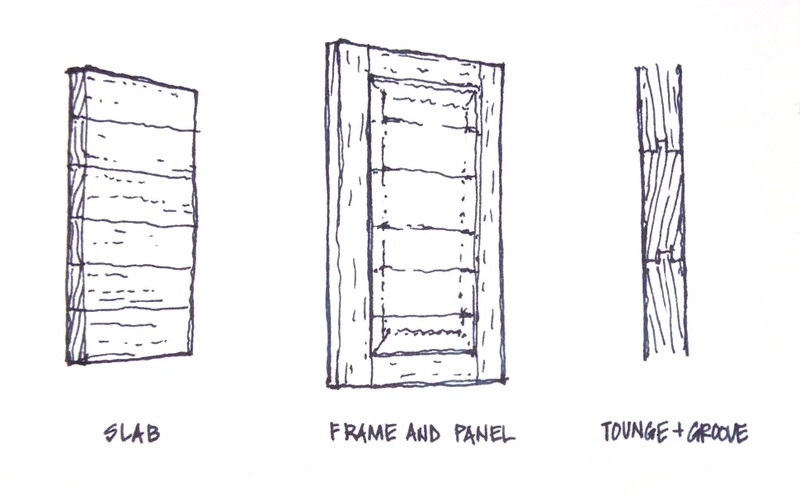 Traditionally, wood movement was managed by floating a panel assembly of wood in a frame. The panel, itself a series of pieces sometimes joined by tongue-and-groove joints, floated in grooves carved into the sides of the styles and rails of the frame that held it. The subtle offsets, grooves, mortises, and tenons all do their job to avoid cracking and maintain a well-formed rectangle for the life of the piece. In fact, the historical name for a woodworker, prior to these engineered wood products, was a joiner. The skill of the craft was artfully assembling solid wood without it coming apart. Today, we are spoiled by engineered wood products: plywood, particle board, high density fiberboard (hardboard, such as Masonite), medium density fiberboard (MDF), oriented strand board (OSB), melamine (plastic coating), laminates (phenolic-impregnated paper), thin wood veneers, laminated timber (glue-lam, cross-laminated, laminated strand), etc. Modern glues and resins, in combination with the re-orientation of wood fibers, make it more stable. I venture that all these engineered products have completely spoiled our sensibilities to natural materials. Before engineered wood products, wood was used only in solid form. Thus the qualitative term solid wood, although I'm not sure anybody really comprehends that term these days. Imagine the challenge of putting together cathedral paneling in solid wood with only weak animal hide glues. Outside of the rare craftsman, all the products we see and use today from big box stores, retail furnishing centers, internet merchants, and mass flat pack channels are created from engineered woods. So, now that all of our wood products are stable, has our understanding of materials warped? 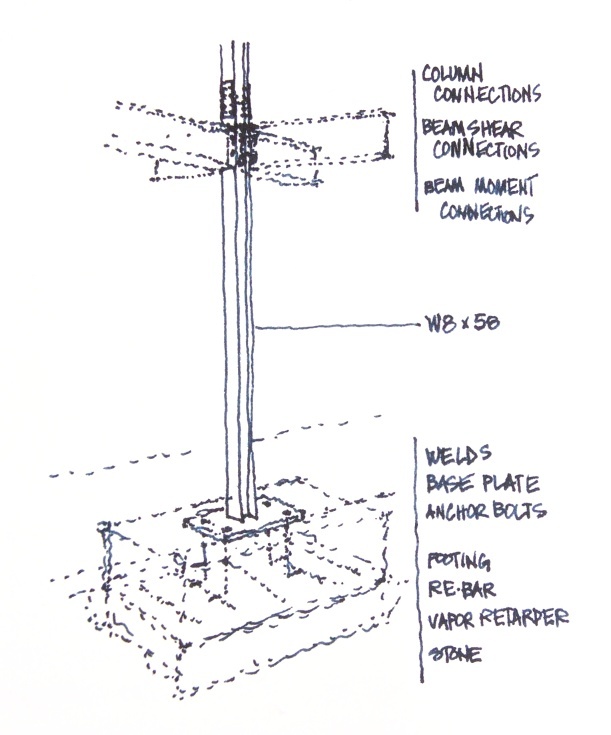 This entry was posted in 4D»2B, Sketch and tagged connections, design, sketch on 2017-06-19 by Steve Hall. 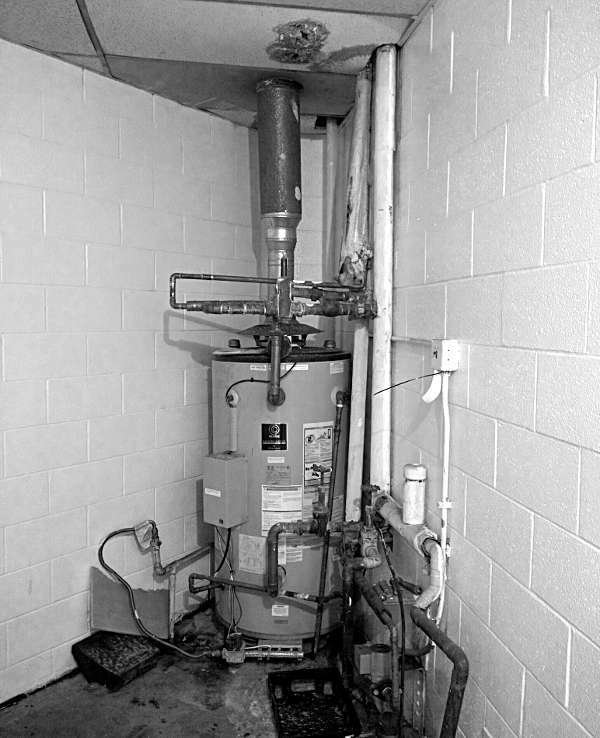 Pre-purchase investigations and renovations always begin with a visit to the property and a tour of the existing building. The first question I always ask is to obtain any documentation and information available about the facility. But frequently, no drawings exist and little, if anything, about the building is documented. I've recently refined and formalized a detailed initial survey and inventory process for an existing building as a Property Condition Assessment (PCA). Having this detailed method gives comfort that we've turned over all the stones and looked systematically for potential pitfalls before the design process. The team looks at everything from the foundation to the roof, the architecture and all the engineered systems in between, and the site beyond. This is all documented in a formalized report, useful for purchase negotiations or evaluating the scope of additional projects within a facility. Whew! Producing all this is a lot of work, especially trying to complete it in just a week or two. It's definitely more thorough than the average field verification route. But this methodical approach takes a building from 0 to 100 with a comprehensive document foundation for making any future explorations or decisions. And its in portable electronic formats, not scraps of paper stashed in the mechanical room. I figured this process expansion and formalization would establish a great place for an architect and engineering team to begin a renovation, but I've recently been finding that a PCA is equally useful to an owner as an initial benchmark of building data, sometimes the first such record since it was built decades before. I like it when we figure out how to solve multiple problems with a singular effort. This entry was posted in 4D»2B and tagged budgeting, commercial, evaluation, field survey, survey on 2017-05-12 by Steve Hall.